Samsung Epic 4G will be available beginning Tuesday, Aug. 31, in all Sprint retail channels, including Sprint.com, Telesales (1-800-SPRINT1) and national retail partners, RadioShack, Best Buy and Walmart, with Sprint Stores opening at 8 a.m. local time. It will cost $249.99 with a new line or eligible upgrade, two-year service agreement, after a $100 mail-in rebate (taxes excluded). For the first time ever, Sprint is offering customers a unique opportunity to reserve Samsung Epic 4G for purchase. Customers can reserve their smartphone for purchase at www.sprint.com/epic4g beginning Friday, Aug. 13., while supplies last. Customers who reserve Samsung Epic 4G will be able to complete their purchase beginning Tuesday, Aug. 31, and must complete their purchase no later than 6 p.m. local time on Wednesday, Sept. 1. Through the reservation process, customers will be able to reserve their devices online, pick them up in a Sprint Store, and receive the full retail experience, including Sprint's Ready Now service. "With its beautiful display and slide-out keyboard, Samsung Epic 4G is a powerful tool for our customers, and it extends Sprint's 4G leadership with a second strong smartphone option," said Sprint CEO Dan Hesse. "As we continue to lead the 4G revolution, we are proud to offer our customers two 4G smartphones, the Overdrive 3G/4G Mobile Hotspot and several 4G USB modems to access the fast speeds on our 4G network in more than 48 cities today. 4G enhances entertainment, gaming and business applications." Powered by the Android(TM) 2.1 operating system, Samsung Epic 4G is part of a new breed of Samsung smartphones offering the best in screen, speed and content quality for a premium user experience, and offers a fully integrated multimedia, messaging and social networking experience. It features an exceptionally thin smartphone design with a slide-out, full QWERTY keyboard and 4-inch Super AMOLED touchscreen display supporting a series of advanced touchscreen gestures, including multi-touch pinch, long tap and zoom and vertical and horizontal swiping. Samsung Epic 4G is the only 4G smartphone to offer three fast and easy ways to enter text onto the device -- a slide-out full QWERTY keyboard, virtual keyboard and Swype technology, which allows users to input text faster and more intuitively with one continuous finger motion across the virtual keyboard. When Samsung Media Hub launches on Samsung Epic 4G, it will be the first and only 4G handset to feature a video store with movies and TV shows available for purchase or rental and video content set up for an HD-like entertainment experience on a handset screen. With 4G from Sprint, users will be able to get turbo-charged downloads of a full library of video and literary content powered by some of the biggest names in entertainment. Samsung Epic 4G will also share user-generated video content with other devices thanks to Samsung's exclusive AllShare service. AllShare wirelessly shares stored music, pictures and HD video to other DLNA (Digital Living Network Alliance) certified(TM) home electronics, including HDTVs, monitors, digital cameras, printers and more. Through AllShare, users will be able to capture moments with the phone's camera and camcorder and wirelessly show them to friends or family on their DLNA-certified HDTV or download music from a PC to Samsung Epic 4G and take it on the road. Samsung Epic 4G's brilliant Super AMOLED touchscreen display offers the best representation of color on a mobile phone that matches original content more than 100 times the contrast quality of other leading displays. It also features faster response time, which reduces "ghosting" images, wide viewing angles to prevent blurring or distortion and a thinner design to offer more accurate and responsiveness to touch. In addition to the dynamic screen, Samsung Epic 4G's six-axis motion sensing uses an accelerometer and geo-magnetic sensor to fine-tune its ability to interpret simple movements and provide an optimal gaming experience. When the phone tilts up and down or left and right, the game can immediately respond in the same direction. A demo of Asphalt 5, a popular racing game, is preloaded exclusively on Samsung Epic 4G allowing users to take full advantage of these advanced gaming capabilities. Samsung Epic 4G is designed to deliver one of the best multimedia experiences for business users in several vertical industries, such as healthcare, education, public safety, construction and professional services, through superior speed and display innovation. It offers support for push email and integrated calendar services, including Exchange ActiveSync, Google(TM) and Yahoo! (R), as well as full support for Google Mobile Services. With Android's open-software platform, businesses can benefit from several productivity-enhancing applications available in Android Market(TM), including bar code scanning, signature capture, document viewing and the ability to stream and upload video for customer approval and archival purposes. 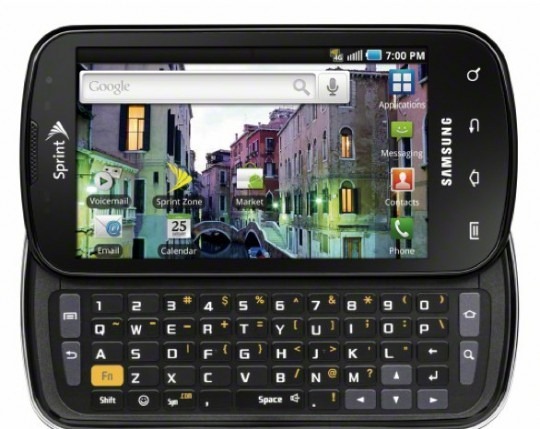 Sprint plans to upgrade Samsung Epic 4G to Android 2.2 in the coming months. With the Android 2.2 upgrade, customers can expect improved EAS support, improved browser performance, including Flash 10x support, voice dialing over Bluetooth(R) and application storage on external memory. In order to provide the best experience, Samsung Epic 4G will use Sprint's industry-leading Everything Data or Business Advantage Messaging and Data plans, which include unlimited Web, texting and calling on the Nationwide Sprint Network to every mobile in America with Any Mobile, Anytime(SM). Everything Data plans start at $69.99 per month. A $10 per month required Premium Data add-on will allow customers to take advantage of a richer data experience than ever before. Additionally, an optional pricing add-on will turn Samsung Epic 4G into a mobile hotspot connecting up to five Wi-Fi enabled devices, such as laptops, gaming devices and digital cameras, simultaneously at 4G speeds where available and at 3G speeds anywhere on the Sprint 3G network for just $29.99 per month (excludes surcharges and taxes). Samsung Epic 4G joins a powerful list of 4G-capable devices from the only national wireless provider to offer 4G service today. Sprint 4G offers a faster wireless experience than any other U.S. national wireless carrier, and Sprint is the only national carrier offering wireless 4G service today in 48 markets. Sprint 4G delivers download speeds up to 10 times faster than 3G(3),giving Samsung Epic 4G the fastest data speeds of any U.S. wireless device available today. As the first national wireless carrier to test, launch and market 4G technology, Sprint made history by launching 4G in Baltimore in September 2008. Sprint currently offers 4G service in these markets: California -- Merced, Modesto, Stockton and Visalia; Delaware -- Wilmington; Florida -- Jacksonville; Georgia -- Atlanta and Milledgeville; Hawaii -- Honolulu and Maui; Idaho -- Boise; Illinois -- Chicago; Maryland -- Baltimore; Michigan -- Grand Rapids; Missouri -- Kansas City and St. Louis; New York -- Rochester and Syracuse; Nevada -- Las Vegas; North Carolina -- Charlotte, Greensboro (along with High Point and Winston-Salem), Raleigh (along with Cary, Chapel Hill and Durham); Oregon -- Eugene, Portland and Salem; Pennsylvania -- Harrisburg, Lancaster, Philadelphia, Reading and York; Texas -- Abilene, Amarillo, Austin, Corpus Christi, Dallas/Fort Worth, Houston, Killeen/Temple, Lubbock, Midland/Odessa, San Antonio, Waco and Wichita Falls; Utah -- Salt Lake City; Virginia -- Richmond; Washington -- Bellingham, Seattle, Tri-Cities and Yakima. For more information, visit www.sprint.com/4G. In 2010, Sprint expects to launch 4G service in multiple markets, including Boston, Cincinnati, Cleveland, Denver, Los Angeles, Miami, Minneapolis, New York, Pittsburgh, San Francisco and Washington, D.C.
(1)HD video recording -- Capture photos and videos for playback on your HD television. (2)Refund excludes usage not associated with the monthly service plan, premium content, third-party billing, international charges and associated taxes and Sprint surcharges. (3) "Up to 10x faster" based on download speed comparison of 3G's 600 kbps vs. 4G's 6 Mbps. Industry published 3G avg. speeds (600 kbps-1.7 Mbps); 4G avg. speeds (3-6 Mbps). Actual speeds may vary. Sprint 4G currently available in more than 45 markets and counting, and on select devices. See www.sprint.com/4G for details. Not all services are available on 4G and coverage may default to 3G/separate network where 4G is unavailable.